with Thayer's investigative work featured as its cover story. Mr. Thayer's account is not only a fascinating look at the nature of insurgencies, intelligence work, and investigative reporting, but also a pleasure to read. I strongly recommend that visitors to the Stage read it in its entirety. Nate Thayer. "How the U.S. 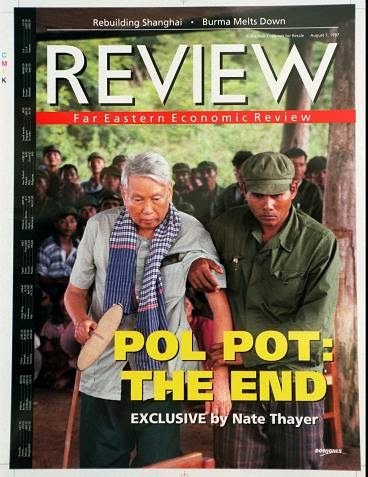 Dropped the Ball When Offered to Bring Pol Pot to Trial For Mass Murder." natethayer.wordpress.com. 24 January 2013. Quoted with permission from author. Scott Reinhard, Expert Button (February 2010). Print at Scott Reinhard Co.
Last month Tom Nichols, professor of national security affairs at the U.S. Naval War College and a well regarded authority on Russian foreign policy and American nuclear strategy, published a thought-provoking essay on his blog titled "The Death of Expertise:"
...I wonder if we are witnessing the “death of expertise:” a Google-fueled, Wikipedia-based, blog-sodden collapse of any division between students and teachers, knowers and wonderers, or even between those of any achievement in an area and those with none at all. I encourage visitors to the Stage to read Dr. Nichol's entire piece. It was prompted by what has become a common experience every time he (or fellow UNWC professor and former NSA employee John Schindler) decides to publish a new essay or speak publicly about a pressing issue of the day. Soon after his work is published a flood of acrimonious tweets and e-mails follow, declaring that he does not really understand how American intelligence agencies, the Kremlin, or the Obama administration actually work. "Tetlock is a psychologist—he teaches at Berkeley—and his conclusions are based on a long-term study that he began twenty years ago. He picked two hundred and eighty-four people who made their living “commenting or offering advice on political and economic trends,” and he started asking them to assess the probability that various things would or would not come to pass, both in the areas of the world in which they specialized and in areas about which they were not expert. Would there be a nonviolent end to apartheid in South Africa? Would Gorbachev be ousted in a coup? Would the United States go to war in the Persian Gulf? Would Canada disintegrate? (Many experts believed that it would, on the ground that Quebec would succeed in seceding.) And so on. By the end of the study, in 2003, the experts had made 82,361 forecasts. Tetlock also asked questions designed to determine how they reached their judgments, how they reacted when their predictions proved to be wrong, how they evaluated new information that did not support their views, and how they assessed the probability that rival theories and predictions were accurate." Tetlock's experts came from all sorts of backgrounds: included were media personalities, tenured academics, professional analysts in Washington think tanks, and employees of numerous government agencies (including those with access to classified materials). A wide range of political beliefs and styles of analysis were also included: the study included both registered Republicans and Democrats, Austrian economists and their Keynesian counterparts, specialists in game theory, realist IR, area studies, and every other analytic model that gained popularity during the test period. What were the results of their 82,000 predictions? "The results were unimpressive. On the first scale, the experts performed worse than they would have if they had simply assigned an equal probability to all three outcomes—if they had given each possible future a thirty-three-per-cent chance of occurring. Human beings who spend their lives studying the state of the world, in other words, are poorer forecasters than dart-throwing monkeys, who would have distributed their picks evenly over the three choices. When confronted with these truths very few experts would admit that their reasoning or their methods were wrong. Instead they would create elaborate justifications for each failed prediction, claiming that their predictions were "almost right," that events had truly been "close calls," or that their prediction was only thrown off by some "out of the blue" or "fluke" occurrence no one could have seen coming. Each failed prediction was successfully turned into a compelling story that not only justified the expert's failures but made things seem as if they and their methods had been right all along. Mr. Tetlock's research deserves to be better known than it is. In addition to Louis Menard's review in the New Yorker excerpted above, interested readers are encouraged to read the CATO Unbound issue devoted to the book, view Tetlock's hour long presentation for the Long Now Foundation, or purchase the book itself. It is difficult to delve into his work and think about experts the same way again. This list is not comprehensive: it is limited to a few of the more stunning examples that have emerged over the last decade (and does not include all of those). But in many ways this is a very old critique. Men like Friedrich Hayek , Hermann Kahn , and Paul Meehl  made similar points (or in Meehl's case, conducted similar studies) decades ago. Their skepticism has deep roots in Western culture; the Western tradition of free inquiry began with a man condemned to death for exposing how little his society's elites actually knew. Thoughtful people have been rejecting expert opinion for two millenia. All of this leaves us with an important question: if experts are no better at making sense of the world than the rest of us, what are they good for? 1) Environments whose size or complexity make it impossible for experts to recognize the patterns or relationships they need to understand in order to make valid judgements about the system (such as faced by economists, ecologists, and financial analysts). 2) Environments where experts must evaluate behaviors, attitudes, past history, and other personal idiosyncrasies to try and explain why individuals act as they do or how they will act in the future (such as faced by psychiatrists, college admissions officers, and court judges). "Political analysis," which usually attempts to explain how statesmen, politicians, soldiers, or other political actors will respond to or instigate changes in world affairs, the electoral arena, battlefields, or some other political environment, falls into both categories! The expert political analyst is expected to create a reliable psychological portrait of key decision makers and understand the the numerous contingencies and complexities of the environment in which these decisions makers work. Unfortunately for the expert, this task lies beyond the limits of human cognition. No human, no matter how learned, experienced, or credentialed, can overcome them. This seems pretty dismal, but as I suggested earlier, our experts need not lose hope. Their advanced degrees were not attained in vain. Too many have simply been proclaiming their expertise in the wrong subjects. Experts have no advantage over the average reader of the New York Times when it comes to political judgements. They are no better--and sometimes worse--at predicting political outcomes, weighing the relative importance of events, or identifying cause and effect relationships than the rest of us. But analyst experts do have a significant advantage over the layman analyst in one domain: they know so much more. Experts can contribute a great deal to the conversation simply by telling us what they know. An easy way to distinguish the difference between these two types of expertise is to think in terms of what and why. Experts are at their best when they explain the "what" of the systems they have spent so much time studying. This kind of expertise is about knowledge, not judgment or analysis; its explanations are not prescriptive or predictive, but descriptive. They focus on confirming disputed facts and explaining the significance of details that layman observers do not have the knowledge to properly understand or recognize. Their job is to find the truth and make it known. This task is far more important than it initially seems. Consider the 'red-line' kerfuffle that made headlines back in September. Several weeks before serin filled munitions were launched into a suburb outside of Damascus called Ghouta. The President of the United States had previously declared that if the Assad Regime used chemical weapons then the United States would intervene in the conflict. The world was left with a question: were these weapons launched by the Syrian Army or one of the groups opposing it? In those days opinions on the subject flew off the presses. Most of this was political analysis par excellence--lots of talk about the various groups' "motives" or "credibility," and the "political logic" of the situation. But as the literature reviewed above suggests, once a certain level of quality was reached, none of these analyses were more reliable than the others. We had ran straight into the limits of human political judgment. Fortunately, there was a more promising route to answering the question at hand. At the time I was closely following Eliot Higgins's Brown Moses Blog. Mr. Higgins, now recognized as an expert in the munitions used in the Syrian war , put together all of the videos and pictures he could get that were in some way tied to the scene of the attacks and compared them to other munitions used in the conflict. His careful reconstruction both identified the exact munitions used in the attack and linked them to artillery and munitions used by Assad's regime. Mr. Higgins here accomplished something only an expert could. The number of Americans who have the background knowledge necessary to identify and distinguish the dozens of munitions used by Syrian militias is limited to a few dozen experts. These men have a true "expert's advantage" that comes from gaining specialized knowledge in the what of an issue. As with the munitions in Syria, analysts who approach this question need a thorough command of things not commonly known: the structure of the PLA, the biographies of the officers in question, PLA-media relations procedure, and the ability to recognize those damn Chinese characters used in all of those press releases and interviews. Only those with a high level of expertise can even participate in this debate. Those of us who lack this knowledge are well advised to take Dr. Nichols's advice to stop our "carping" and listen to what these folks have to say. One suspects that the unpolished masses who flood Dr. Nichol's and Schindler's inboxes with insults and assertions do not do so because they have been reading Philip Tetlock's most recent research. While we have reviewed plenty of compelling evidence that experts and expert claims should be viewed with skepticism, the great majority of this research is unknown among even the more educated sections of the body politic. What accounts for this widespread hostility towards expertise? Some of it is purely due to the globalization of communication. There are no longer any gatekeepers: the journals and op-ed pages that were once strictly edited have been drowned under the weight of self-publishable blogs (like, say, this one). There was once a time when participation in public debate required submission of a letter or an article, and that submission had to be written intelligently, pass editorial review, and stand with the author’s name and credentials attached. Even then, it was a big deal to get a letter in a major newspaper. Now, anyone can crowd the comments section of any major publication with inane blather. We live in a huge high school boys’ room, where anyone with a marker can write anything on the wall. Sometimes, that kind of free-for-all spurs good thinking. Most of the time, it just means people can post anything they want, under any anonymous cover, and never have to defend their views or get called out for being wrong. ...I also would argue that colleges have to own some of this mess. The idea of telling students that professors run the show and know better than they do strikes many students as something like uppity lip from the help, and so many profs don’t do it. Many colleges are boutiques, in which the professors are expected to be something like intellectual valets. This produces nothing but a delusion of intellectual adequacy in children who should be instructed, not catered to. All of these things may have an influence on current attitudes towards experts and educated expertise. But I think Nichols has missed an important ingredient--perhaps the most important ingredient--of the hostility he and his compatriots receive. 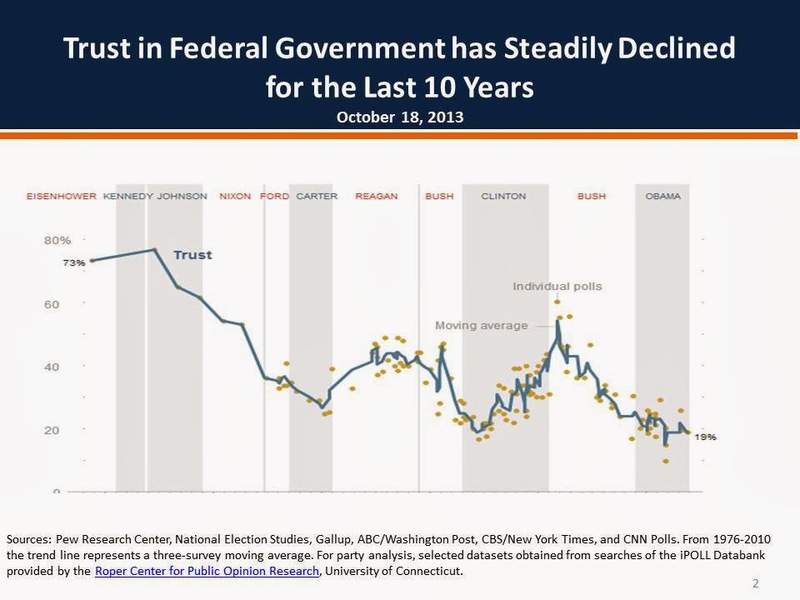 Reported Trust in Government since 1950s. Figure 2 from Doug Sosnik, "What Side of the Barricade are You On? ", Politico, 25 November 2013. Figure 3 from Doug Sosnik, "What Side of the Barricade are You On? ", Politico, 25 November 2013. These two images were originally presented in an astute essay that political strategist Doug Sosnik wrote for Politico. These are just two of the many data points Sosnik uses to capture the sense of alienation and outrage the American public feels towards their leaders. 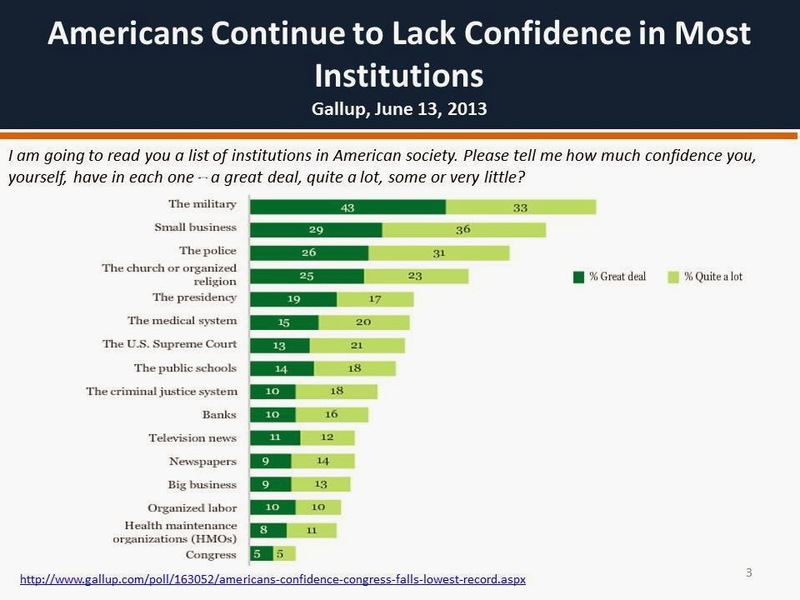 The picture is pretty clear: Americans do not just doubt their experts. They doubt every institution American society has invested with authority! This crises in public confidence is a storm no authority figure can run away from, experts included. It is not difficult to understand how experts are caught up in this great swell of hostility towards American elites. "Our Republic", the narrative goes, "wasted a decade fighting wars our experts claimed would be done and over with in a few years. We still haven't picked ourselves up from a recession these experts did not see coming. Why should we trust another expert again?" It is unfair to blame all of America's ills (or even the specific ones mentioned above) on our hapless experts. But the truthfulness of the narrative is irrelevant. What matters is how people who live far away from the ivory towers and government offices see the experts who dwell there. And in in this kind of political climate the experts who craft political analysis defending the powers that be should not be surprised when they are met with unrestrained hostility and extreme skepticism. It is the cost of claiming expertise. It is not just the politicians that will be forced through the grinder. Everybody who talks politics or claims a position of special authority is going to be, or is already, facing this scrutiny. People are wondering what side of the barricade America's credentialed class of experts belong. Tom Nichols. "The Death of Expertise." The War Room (11 December 2013). Louis Menard. "Everybody's an Expert: Putting Political Expertise to the Test." The New Yorker (5 December 2013). The key articles are John Iodannis, "Why Most Published Medical Research is False," PLOS Medicine (30 August 2005); John Iodannis, et. al, "Persistence of Contradicted Claims in the Literature," Journal of American Medical Association, Vol 298, No 21 (5 December 2007); Danielle Fanelli, "How Many Scientists Falsify and Fabricate Research? A Systematic Review and Meta Analysis of Survey Data," PLOS One (29 May 2009); "'Positive' Results Increase Down the Hierarchy of Science," PLOS One (7 April 2010). I strongly recommend those unfamiliar with this line of research read David Freeman's review essay for the Atlantic, "Lies, Damned Lies, and Medical Science" (4 October 2010). Ben Goldcare, "What Doctors Do Not Know About the Drugs They Proscribe," presentation given at TED Med 2012 (June 2012, pub. Sep 2012); Adriane Fugh-Berman and Shahram Ahar, "Following the Script: How Drug Reps Make Friends and Influence Doctors," PLOS Medicine (24 April 2007). Nassim Nicholas Taleb, The Black Swan: The Impact of the Highly Imporbable. Rev. ed. (New York: Penguin Books, 2010). pp. 145-151. While James C. Scott's books and articles are legion, I believe that his essay, "The Problem With the View From Above," CATO Unbound (8 September 2010), is the best introduction to his work on this topic. Friedrich Hayek, "The Uses of Knowledge in Society," American Economic Review. Vol. XXXV, No. 4(Sep 1945). pp. 519-30. American Economic Association. William M. Grove, "Clinical vs. Statistical Prediction: The Contributions of Paul E. Meehl," Journal of Clinical Psychology, Vol. 61, No. 10 (2005), pp. 1233–124. Daniel Kahneman and Gary Klein, "Conditions for Intuitive Expertise: A Failure To Disagree," American Psychologist, vol 64, No. 6 (September 2009), p. 522. Bianca Bosker, "Inside the One Man Intelligence Unit That Exposed the Secrets and Atrocities of the Syria War," The Huffington Post (18 November 2013); Patrick Raden keefe, "Rocket Man: How An Unemployed Blogger Confirmed Syria Used Chemical Weapons," The New Yorker (25 November 2013). The full citations for the articles discussed are: Andrew Chubb, "Propaganda as Policy? Explaining the PLA's "Hawkish" Faction, pt 1" The China Brief: A Journal of Analysis and Information, Vol XIII, Issue 15 (26 July 2013), pp. 6-11; "Propaganda as Policy? Explaining the PLA's "Hawkish" Faction, pt 2" The China Brief: A Journal of Analysis and Information, Vol XIII, Issue 16 (9 August 2013), pp. 12-16; Yawei Liu and Justine Zhang Ren, "An Emerging Consensus on the U.S. Threat: The United States According to PLA Officers," Journal of Contemporary China (19 November 2013); Andrew Chubb, "Are China's hawks actually the PLA after all? [Revised]," South Sea Conversations (or. pub 5 December 2013, rev. 17 December 2013). Tom Nichols, "The Death of Expertise." “As for the effect which one man’s intellect can have upon another’s, it is of necessity much curtailed in a country where its citizens, having become almost like each other, scrutinize each other carefully and, perceiving in not a single person in their midst any signs of undeniable greatness or superiority, constantly return to their own rationality as to the most obvious and immediate source of truth. So, it is not merely trust in any particular individual which is destroyed, but also the predilection to take the word of any man at all. Each man thus retreats into himself where he claims to judge the world"
-Alexis de Tocqueville, Democracy in America and Two Essays on America, trans Gerald Bevan (New York: penguin Books, 2003), p.494. See also pp. 493-503 generally. This does not sound unlike the very attitudes that prompted Dr. Nichols to write his essay. The men of 1834 and 2014, of course, are not quite the same. Every man should be an expert of his own community. The average antebellum man had a great deal of control over the political realities most important to his well being. The average American of the 21st century cannot claim the same. Doug Sosnik, "What Side of the Barricade are You On? ", Politico (25 November 2013). Late last year Social Psychiatry and Psychiatric Epidemiology published a study titled "The Immigrant Paradox: Immigrants are Less Antisocial Than Native Born Americans." Given how closely certain sections of the blogosphere cover all things ethnic I was a tad surprised to find that no one has been talking about this paper and its conclusions. This is a shame, because the results are pretty interesting. Africans, it seems, are the most pro-social immigrants in America! In other words, immigrants are not making America a more criminal place. America makes her immigrants become more criminal people! It is not uncommon for conservatives to bewail the many immigrants America has who have not properly assimilated into broader American culture. These concerns are not without merit. Yet when I think about assimilation my thoughts usually dwell upon on a slightly different problem. I remember well the many immigrant families I worked and lived with when I was a LDS missionary tramping across America's urban ghettos. So many immigrant mothers and fathers would let us in the door because they were worried about their children. They felt like their families were being torn apart, parents and children living in completely different worlds--and reflecting upon it now, it is not difficult to see why they felt this way. Particularly striking were the Haitian families whose parents took pride in their educated French but whose children could only speak the English of the ghetto. Perhaps we should be less concerned with whether immigrants can assimilate into American culture and more concerned with which American culture immigrants are assimilating into. EDIT (8 Jan 2013): see also Tyler Cohen's recent post on 'downward assimilation' among African immigrants for more research that echoes these themes. Michael G. Vaughn, Christopher P. Salas-Wright, Matt DeLisi, and Brandy R. Maynard. 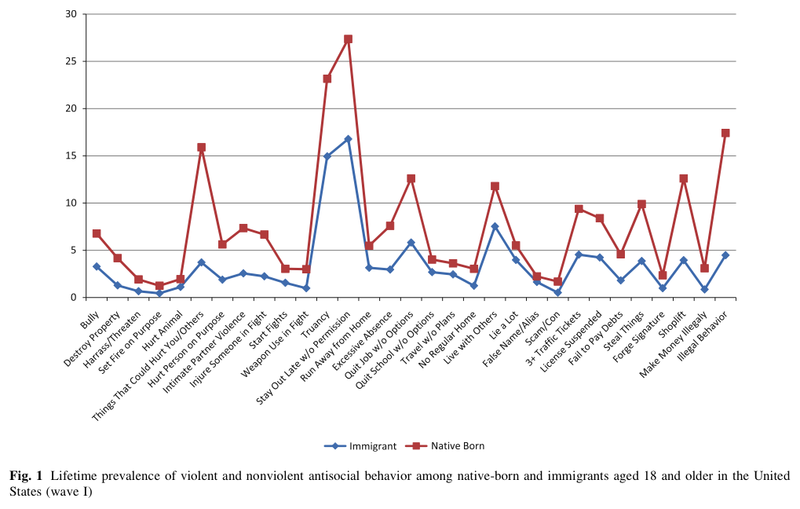 "The immigrant paradox: immigrants are less antisocial than native-born Americans." Social Psychiatry and Psychiatric Epidemiology. Vol. 48, Issue 11. 17 November 2013. p. 3. Emily Alpert Reyes, "Immigrants less prone to violence, 'antisocial' behavior, study says," Los Angles Times. 3 December 2013. For example: Matthew T. Lee and Ramiro Martinez, "Immigration reduces crime: an emerging scholarly consensus" in William F. Mcdonald (ed.) Immigration, Crime and Justice (Sociology of Crime Law and Deviance, Volume 13), (Bingely: Emerald Group Publishing Limited 2009), pp. 3-16; Casey T. Harris and Ben Feldmeyer, "Latino immigration and White, Black, and Latino violent crime: A comparison of traditional and non-traditional immigrant destinations," Social Science Research, Vol. 42, Issue 1(Jan 2013), pp. 202–216; Ron Unz, "Race and Crime in America," The American Conservative. 20 July 2013. Michael G. Vaughn, et. al., "The immigrant paradox," p. 7. I'm From Princeton, and I'm Here to Help! Illustration by Faine Green. "Expat Field Guide: Ivy League Grad Who Is Here To Save You." Faine Opines. 2 January 2014. While funny, the Ivy League lament that "I should have gone into finance" is no joke. In her ethnography of investment finance Karen Ho reports that 40% of all Princeton undergrads went to work on Wall Street after graduation. The young globe trotting do-gooder caricatured here is in a definite minority. Indeed, it might do America good if more of our Princeton t-shirt donning 20-somethings ended up in hot places where they will hate the food, have their bike stolen (despite buying that iron padlock), and will spend more uncomfortable hours squatting over a toilet than they thought was possible. 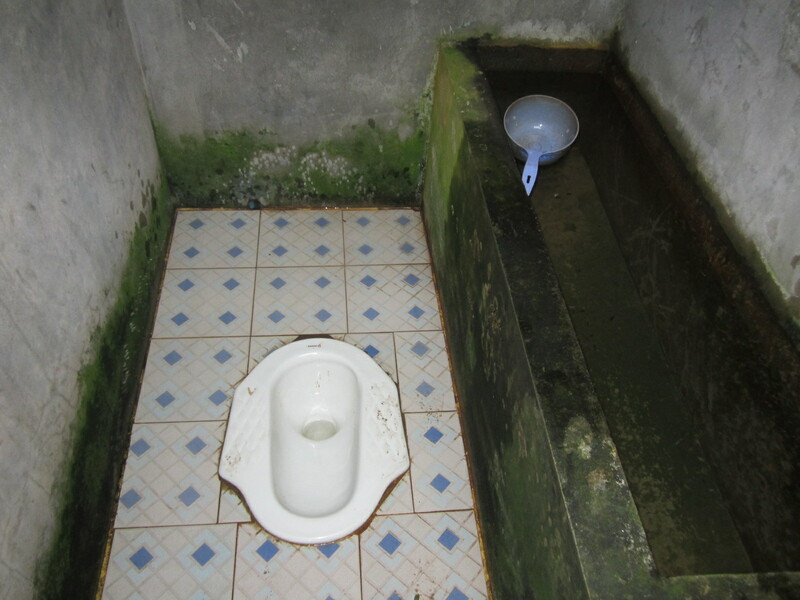 It is less clear if these graduates will do Cambodia any good. In any case, be sure to check out some of Ms. Green's other caricatures, The Terrified PhD Candidate, Australian Yobbos, American Contractors on Leave, and French People. Faine Green. "Expat Field Guide: Ivy League Grad Who Is Here To Save You." Faine Opines. 2 January 2014. Karen Ho. Liquidated: An Ethnography of Wall Street. (Durham, NC: Duke University Press, 2009), 44.